Windsor has been without a direct road link to Eton since April 1970, when engineers decided that the old cast iron bridge was no longer up to the task of carrying thousands of vehicles, including buses, day in day out, as cracks had developed in the supporting cast iron girders. 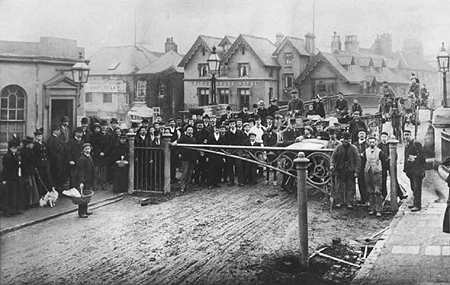 In this article we look at the history of Windsor Bridge. It is worth noting that, prior to the construction of the M4 motorway in 1963 there was no crossing point for vehicles over the Thames at any point from Windsor to Maidenhead Bridge, a distance of over 6 miles. For many years there was discussion about this shortcoming and a variety of proposals were made to ease the problems that this caused. Eventually it was decided to construct the Windsor Relief Road and the Elizabeth Bridge, work commencing in July 1964 and completed in July 1966. It is fortunate that this new crossing was completed before Windsor Bridge itself was finally closed. In 1938 a start had been made on a new Thames crossing near the present M4 bridge at Bray but the Second World War caused the project to be abandoned. Many residents in the 1940s wanted the Orbital Road around London expedited, now known as the M25, but at that time the concept was merely a line on a map. It was deemed essential by the 1970s to relieve pressure on the limited river crossing capacity in the Windsor and Maidenhead area. Prior to the completion of the M25, and even after its completion up to a point, drivers from as far as the south coast would make for the crossing at Windsor on their way to join the M1 at Watford. Although it is beyond the scope of this article, the effect of local traffic 'improvements' will have an effect for many miles around as drivers, both commercial and private, elect to change their route to take advantage of a new bridge or bypass. The story of Windsor Bridge starts almost 1000 years ago, when William the First, William the Conqueror, first established a fortification on the chalk ridge known as Clewer Hill, and which subsequently became the castle we know today. This history of the Castle and the town is covered in other articles on the Windsor Web Site, (A Brief History) for now it can be imagined that the movement of the court, from Old Windsor, at Kingsbury, to 'New' Windsor surrounding the castle, would have almost immediately required a wharf and a crossing of some sort to the northern bank, subsequently to become Eton. No doubt ferrymen would have filled the demand for a good few years, but it is likely that the first wooden bridge was built in the 1100s. It is recorded that in 1172 a certain Osbert de Bray a farmer from Windsor, derived £4 33p from tolls levied on vessels passing beneath the bridge. This must have been lucrative for de Bray as river travel was very popular form of transport when the road system hardly existed. Alfred the Great apparently travelled from Oxford to London by river in 875. Two hundred years later the Doomsday Book records that goods were sent by river since Edward the Confessor's time (1050). River cargoes to the court at Old Windsor included wine, iron, ropes, royal baggage, even prisoners. Ships could be 'free from molestation' by royal gift. The river was therefore an important highway from London, Hampton Court, Richmond and Staines, through to Windsor, and onward as far as Oxford and the Midlands. There are records that in 1242, permission was granted for oak trees to be felled in Windsor Forest for the purpose of constructing a new bridge between Windsor and Eton. The original bridge would have been damaged on a number of occasions, both by floods and wayward barges, and doubtless was beyond repair. At some point a winch was installed adjacent to Windsor Bridge to help drag the laden barges upstream against the current. The procedure required to manoeuvre a laden, horse-drawn, barge upstream was complex, and at one point even required the horse to swim from The Cobbler, since removed, at the end of what is now Romney Island, across to the south bank. The cycle of repair and rebuilding would have continued through the ages until finally in 1819 the wooden bridge had deteriorated to such an extent that a new bridge, made from modern materials and sturdily constructed was decided upon. 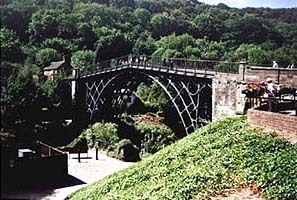 Some 60 years earlier, at Ironbridge, a new material had been discovered that offered much more strength and durability than wood. This material was cast iron. As a testament to this durability, the structure at Ironbridge still stands to this day. It remains the very first metal bridge anywhere in the world. Charles Hollis, the bridge's designer, used cast iron when rebuilding the Parish Church in Windsor for the pillars and the roof supports in 1820-1822. It was claimed to be stronger and stiffer than timber and far stronger than masonry for columns and arches. It was natural therefore for the Windsor Corporation to choose this new 'wonder' material, cast iron, and an Act was passed that allowed the reconstruction of the Bridge. The local paper of the time reported that "The Corner Stone was laid in 1822 by the Duke of York with Masonic Ceremonies. The expectation excited by the usual splendour of Masonic ceremonials, and the assurance the Duke of York would be present on the occasion, attracted a great number of strangers to the town. The very limited area prevented the accommodation of spectators to see the ceremony, excepting those gentlemen forming the procession for whom a platform was built." Express, July 13th, 1822. The silver trowel used for this ceremony is preserved among the town plate. 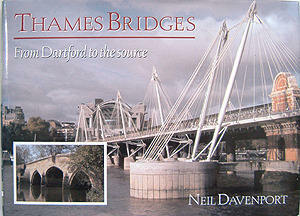 The bridge was built by Mr William Moore (who died before its completion) and completed by Moore's executor, Mr Baldock. During construction a barge hit the works and sank, the cast iron ribs from Wales included some that were defective and broke as they were unloaded, replacements having to be made in London, while others were 'repaired'. A labourer working on the 'piling' slipped and fell as the "monkey" (hammer) was on its downward path. He was crushed to death leaving a wife and "a number of children". Express, May 25th 1822. The council maintained a ferry during the works, and one collector, William Quarterman, was paid thirty shillings a week but had to find his own coal and candles. Charles Hollis was the architect, and Thomas Telford was involved in its design, though no evidence has come to light so far that he actually visited Windsor in the course of the bridge building. His help was probably more advisory, with regard to the foundations. 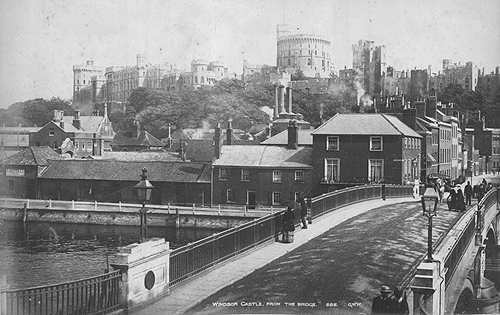 There certainly had been problems during the bridge's construction as another cutting from the Express, dated July 6th 1823, suggests: "We have much pleasure in having authority to relieve anxiety relative to the building of Windsor Bridge. The rumours that the foundations of the new structure are being washed away by currents as fast as they are put in are without any foundation!" In the Express of 3rd August 1823 it was reported that "the contractor is employing 4 chain pumps and a steam engine and 40-50 Scots Fusilier Guardsmen". It may well be that the problems of construction were being overcome, but it can be imagined that a project of this nature, although theoretically understood, could well have generated its own individual set of problems as construction proceeded. The situation is not unknown today! Certainly the digging of the supports, set deep in the river bed would have presented their own constructional problems and it is known that at least one cast iron section was damaged and had to be replaced before it could be finally positioned. The bridge was constructed as three arches supported by two massive granite pillars set deep into the river bed. Between each pillar were seven supporting arches in cast iron. It was not until 1830 that a critic of cast iron, Mr Eaton Hodgkinson, proved that cast iron was only one sixth as strong in tension as in compression, to the horror of Windsor Corporation with their newly completed cast iron bridge over the Thames. They thought that every precaution had been taken, even the great Thomas Telford had been consulted, although this was mainly about the foundations. We now know of course that the Corporation need not have worried because Windsor Bridge is an arch bridge, and therefore the cast iron is in compression mostly and perfectly adequate for its purpose, as the subsequent 150 years proved. It is true that the bridge developed cracks at some point in its history, (in those areas where the was an element of tension), but it had already been used for a very long time by heavy traffic that the original designer could not possibly have envisaged. 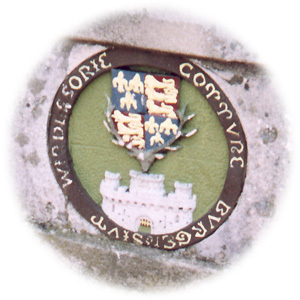 On the left and right hand sides of the bridge, and at both ends, there are replicas of the New Windsor Coat of Arms. In Victorian times a wire mesh was placed over the roundel to protect it. Featuring the Royal Standard of Edward I and the castle motif of his Queen, Eleanor of Castile. 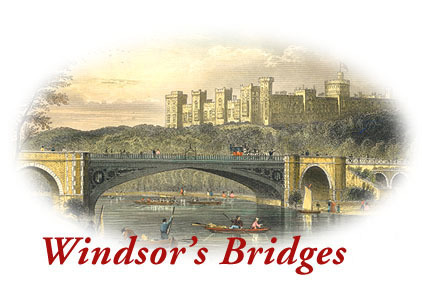 In an entry in the Express, dated May 1st 1824, a relieved editor could publish that ''We have the greatest satisfaction in stating that the Windsor Bridge is built at last. The highly respectable engineer, Mr Charles Hollis, has pledged himself to the structure, the completion of which has been long delayed and will be ready to open this year." So by 1st June 1824, at a cost of £15,000, the new bridge was completed. For many years after the bridge was first opened, Windsor Corporation charged a toll for its use. One toll was six shillings for carrying a corpse over the bridge. There were a series of public protest meetings, and in 1874 the Theatre Royal was packed to overflowing. The row reached Parliament and the courts and eventually the objectors succeeded in getting the tolls scrapped. The chief protestor in the campaign was a Mr Joseph Taylor of Eton who, after many years, saw his objective achieved on 1st December 1898 when the toll gates were formally removed. 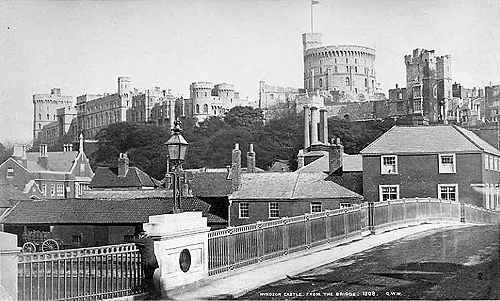 1st December 1898 and the toll gates, on the Windsor side, are removed. A Year Book, wrapped in a Macintosh bag, was found under the Foundation Stone of the Destructor in Dedworth containing some details about Windsor Bridge. The Destructor (for rubbish disposal) had been built in 1904 and was destroyed by a flying bomb on July 1st 1944. In 1894, following the floods of that year, "Deucalonia", a booklet featuring stories of the floods in verse and pictures, described how a barge had been swept against Windsor Bridge. In August, 1938, Col. Barker, then Chairman of the County Highways Committee, said that "the bridge was a bad type, it was cracked in three places and was really unsafe. " The rebuilding of the bridge was certain to come within the next few years." The bridge of course was never designed to take the weight and speed of 20th century traffic. It had a weight limit on it for some time, but this restriction was often ignored, heavy military vehicles using it during the Second World War and this could well have aggravated its condition. 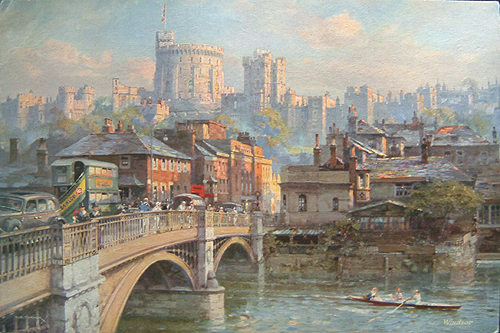 A painting by C E Turner of Windsor Bridge in the evening sunlight (1935) for a commission by the Dunlop Tyre Co who used it for their 1936 calendar. After 150 years the original pessimism of Mr Hodgkinson in 1830 proved right, when, in 1969 at an Emergency Meeting of the Surveyor's Department of Berkshire County Council, who had responsibility for major roads by that time, it was decided that cracks in the cast iron arches required traffic to be restricted to a single line controlled by lights. By April 10th 1970 the last vehicle crossed the bridge at 4.00pm following another Emergency Meeting in the Borough Engineer's office in Windsor, in the presence of county officials and the police. Posters, diversion signs, re-routing of buses and press publicity all marked the demise of the bridge as a main vehicle route across the Thames at this point. Immediately pressure from local traders built up for a temporary bridge of some kind, especially those on the Eton side. 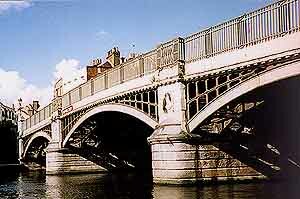 Eton Urban District Council was particularly anxious to see the bridge reinstated in some form or other. In 1963 the damaged Victoria Bridge had seen a war-time Bailey Bridge erected over it to maintain the Windsor - Datchet link, and demands were voiced immediately for a similar structure to be installed over Windsor Bridge but the Borough Engineer at the time, Gordon Cullingham, produced a report and montage showing how such a bridge would seriously affect the area. Although a Bailey Bridge could be constructed in about two weeks and could take vehicles up to 12 tons, including buses, and with two pedestrian pathways, traffic could only travel northbound. 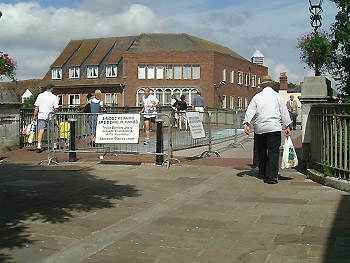 The local Chamber of Trade, and their Chairman, Geoffrey Dyson, decided that, although they felt trade had been badly affected, the demand for a Bailey Bridge would be dropped and that Eton would have to become a motorised pedestrian precinct to avoid the chance that a temporary structure might become permanent. Also, the return of through traffic was considered too dangerous and that the bridge might adversely affect adjacent traders such as The Old House Hotel and shops in Thames Street, as well as in Eton Bridge approach. Traffic congestion in Windsor town centre would become as bad as it had ever been. For these reasons also, an offer by Windsor Corporation to repair the bridge to take traffic up to a weight limit of 3 tons was also rejected. The montage which sealed the fate of the temporary Bailey Bridge had been prepared with the help of Stan Kingsley Jones (photographer) and was reproduced in the Express of May 1st 1970. Pressure for the reconstruction of the Bridge was applied from other sectors too. The authorities from Berkshire County Council demanded that Buckinghamshire pay at least £250,000 towards the cost of a new bridge, estimated to be £1.25m at the time, but received a 'dusty' answer. Eton Urban District Council proposed a march to 10 Downing Street and some traders refused to pay their rates. 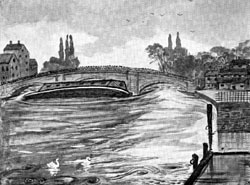 According to George Waldram, the Town Clerk at the time in Windsor, the matter was turning into a "slanging match" and that the solution was to expedite the M25 Orbital Road with its bridge at Staines. Raymond South, councillor and teacher, reported that some residents wanted a bridge "with great constrictions on the amount of traffic using it" but added that no minister would ever sanction such a scheme. 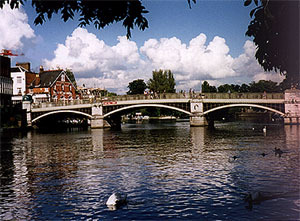 In the course of the wranglings it was suggested by government that Slough and Eton (in Buckinghamshire at that time) should become part of Berkshire to weaken the pressure to rebuild the bridge. (February 1971). Repairs such as "stitching" or welding the cracks would not be approved as neither would be successful although alarmists were claiming that the bridge would fall down unless attended to. There was no scientific or engineering truth in these scares. Finally, in December 1971, a Public Inquiry was opened at Windsor Guildhall. Both Windsor and Berkshire's authorities wanted to keep the bridge closed to traffic, while Eton UDC and Buckinghamshire pressed for its rebuilding. The Crown Commissioners, with concern for traffic through Windsor Great Park, supported closure, provided certain conditions were applied. The Inquiry Inspector was Mr R H Austin, who had been born in Windsor. His recommendation was that there should be a new traffic plan for the area. This was costed at £125,000 and was to cover Slough and East Berkshire. A chronology of events appeared in the Evening Mail of December 13th 1974. In March 2000 the Borough undertook a load assessment on the bridge and decided that there was 'insufficient capacity to carry unmanaged pedestrian loading'. For this reason restrictions were set up on the bridge using temporary barriers that prevented pedestrians from walking on the central areas of the bridge. The report found that whilst the main arch ribs were generally good, 40% of the spandrels were cracked or sheared. The Metalock repair method was proposed, which is virtually invisible. At the same time parapet strengthening was thought advisable due to the high levels of pedestrian use. Plans were drawn up featuring a second parapet adjacent to the first, with integral lighting. York stone would be used for the paved area instead of the paving slabs and concrete blocks previously used and which would match other local schemes. Additional lighting was proposed also for the pedestrian area, and the external areas of the bridge, designed to avoid reflections from the water beneath. The external lamps would be colour coded to match the structure. Four lights would be used to illuminate the central piers. In February 2002, work was started on refurbishing the bridge, the delay being caused by a failed attempt to obtain lottery funding. 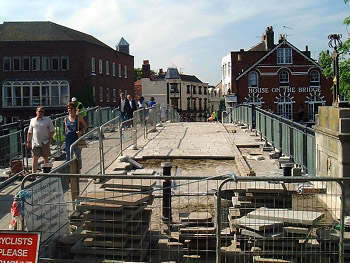 The costs of the renovations were met by Windsor and Maidenhead Borough Council and were completed towards the end of May, 2002 in time for H.M. Queen Elizabeth II's Jubilee celebrations. As the bridge is a listed building, Grade II, consent was required before the work could commence. Funding for the project was applied for from the Heritage Lottery Fund as the costs were expected to be in the region of £400,000 but the application was not approved. Windsor and Maidenhead Borough Council therefore elected to pay for the restoration themselves. The restoration was completed in time for the Queen's Jubilee celebrations in June 2002 when the Queen opened the bridge and unveiled a plaque commemorating the refurbishment on June 3rd at 12.00. 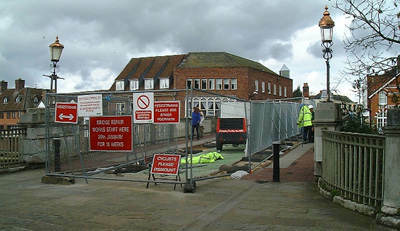 May 2002 and the final few paving slabs of York stone are positioned. The famous photographer, George Washington Wilson, visited Windsor on several occasions and in 1876 he took a series of pictures from Windsor Bridge. These subsequently appeared in his catalogue of 1877. This view was listed as no. 1308. A similar view from Windsor Bridge, although this time the camera is higher, showing more of the buildings opposite the Riverside Station. It bears the number 582. Although taken at a similar time of day, with the sun to the right and in the west, the trees are taller and GWW must have decided to take the photograph from a higher position so as to get as much of the castle into his shot as possible. This image probably dates from GWW's visit in 1895 or 1896. Windsor is fortunate that the Elizabeth Bridge and the Relief Road, by-passing the town centre and Eton High Street, had been completed in 1966, five years before the town bridge had eventually to be closed, as this could accept diverted traffic without difficulty, though not without inconvenience to local shoppers, and the concerns of traders in Eton. The bridge was opened on 11th July 1966. 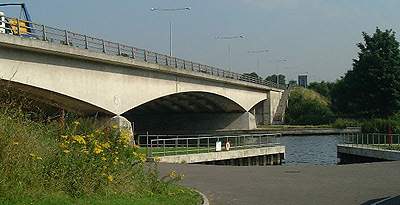 Had the Elizabeth Bridge not been completed, traffic diversions would have been major, requiring traffic for many miles around the town being directed further up the Thames to Maidenhead and the M4 crossing, or funnelling large volumes of traffic through Datchet village via the Victoria Bridge. The Elizabeth Bridge, upstream to the west of Windsor. Windsor's bridges are covered in some detail and also makes mention of the original Datchet Bridge in use prior to the construction of the Albert and Victoria Bridges and now long since demolished. The railway bridges are also included and provide some background and additional information that would have taken some time to research. The book is therefore a useful addition to the history of the Thames. Berkshire Records, previously at Shire Hall, Shinfield Park, Reading, Berkshire received the 'Bridge Box' from Windsor, however, records and archives, scattered since the demise of Berkshire County Council, have not been indexed as of 2000.